What is the working principle of elevator door lock? 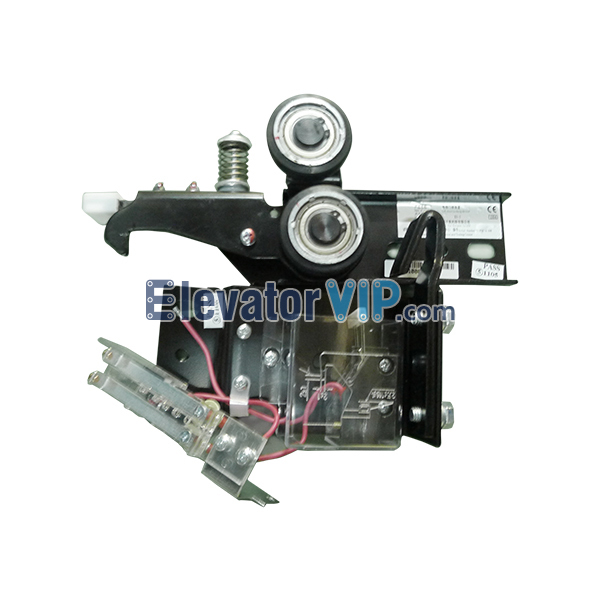 Elevator lock, it is car door, layer door lock device (refer to commonly layer door). Under normal circumstances, the door cannot be opened without a locking device, protecting the person from being cut or falling. It is an important safety device for elevator. The lock is mainly composed of lock hook, lock block, force element, roller, open lock door wheel, electric safety electric shock and triangle lock. Tock hook and lock block constitute lock effect. The lock door shall not be opened, and the meshing depth shall be over 7mm, and the endurance shall be over 1000N. The applied force element is used to automatically reset the door lock after opening the door. It is a reset device (when it fails, gravity shall not open the door lock). The roller and the unlocked door wheel are used to open the lock. When the elevator arrives at the station, the door operator is driven by a series of mechanical drives. Finally, the door cam is used to drive the roller and the unlocked door wheel to open the door lock and pull the door open. The electric safety shock is to verify whether the lock hook and lock gear meshing reach more than 7mm. Once the electric safety shock is broken, the elevator shall not operate. 5) Triangle lock is used to open the layer door under abnormal circumstances, that is, the triangle lock on the layer door. Non-professionals are not allowed to use it. The working principle of elevator car door lock: push from inside to outside of well way, can be used to escape. There is an electrical switch to verify that the door is closed. When the space between the adjacent two layers of door sill is greater than 11m, the height and width shall not be less than 1.80m and 1.80m respectively no less than 0.35m shaft safety door. The door lock of elevator door is a mechanism responsible for opening and closing the door of elevator hall. When it receives the signal of elevator opening and closing, elevator door machine controls the door operator through its own control system, which converts the torque generated by the motor into a force in a specific direction, and closes or opens the door. When the closing force of the door is greater than 150N, the door machine will automatically stop closing the door and reverse open the door to play a certain degree of closing protection. Posted in Technology and tagged cheap elevator car door lock in China, elevator car door lock factory, elevator car door lock manufacturer, elevator car door lock online, elevator car door lock supplier, elevator door cam, elevator door lock, elevator door lock is a safety device for elevator, elevator part of triangle lock, layer door lock device, working principle of elevator car door lock.